Paul writes: on a warm summer evening I like to sit in my garden with a light on and see what moths will come in. One of the best to arrive is the Elephant Hawk-moth (Deilephila elpenor). It makes its presence known quickly. Most moths will spend some time flying around before settling on the ground but this one comes crashing in without any warning. 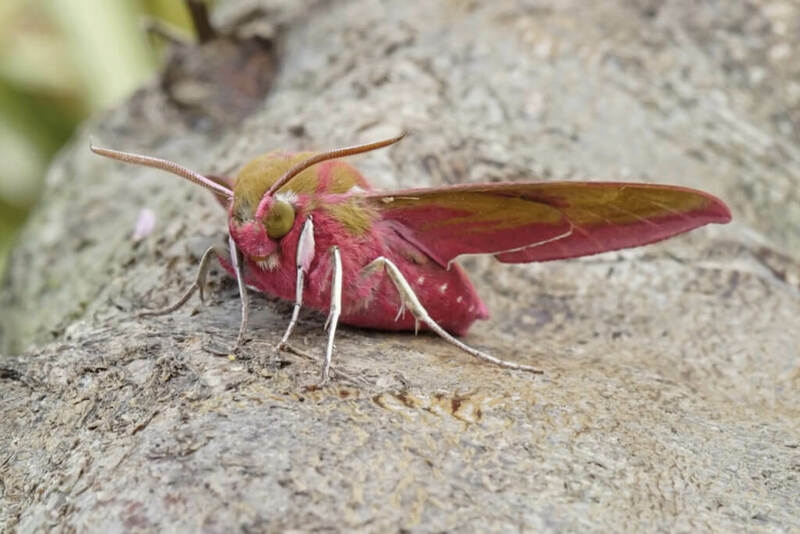 It’s a fantastic moth and easily identified by its size and bright pink and olive green markings. With a wing span of 45 – 60 mm it’s a pretty impressive creature. The moth is active from dusk onwards and can be seen feeding on a variety of garden flowers, typically Honeysuckle and other tubular nectar producing flowers and it is also easily drawn to light. It occurs throughout Britain and is a fairly common moth. Larval foodplants include willowherbs, bedstraws, fuchsias and Himalayan Balsam, so any garden with these plants in the neighbourhood will have good chance of attracting one at night. It occurs from June until early August and usually visits me around mid July. Which is when I saw this one, last year.